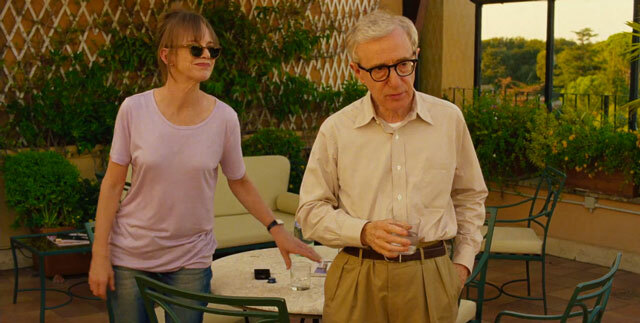 Besides a few new shooting locations, Woody Allen hasn’t changed a lot during the span of his career. Not that he has to. Every one of his films open with the same white font against a black background as classical music plays. It never gets old. “To Rome with Love” opens in this same way. However, this time around, classical music will become a pertinent part of the film. The film opens with a crossing guard on a busy street in Rome, who is the first narrator introduced. As is the typical narrator in a Woody Allen film, he directly addresses the camera while in front of it, instead of only existing as a voice offscreen. This makes sense, as Allen’s films seem to be a way of letting his odd subconscious run wild. “To Rome with Love” doesn’t come near the same territory that “Midnight in Paris” dwelled in, yet it is almost always exciting and funny. “To Rome with Love” is told in four vignettes which never interlock, and never should. Three of them thematically fit together. Another one is kind of just there and has just a few inventive moments. The film opens as a young Italian couple (Alessandro Tiberi and Alessandra Mastronardi) get off of a train and get ready to start their new life together. Antonio (Tiberi) is hardworking businessman who is always nervous about something. While his wife Milly just wants a haircut that will make her look young and hip, Antonio worries that she won’t make it back on time to meet his family. She gets the same terrible directions to the salon from every Roman she encounters, and ends up lost and without a cellphone. While wandering the streets of Rome, she bumps into her favorite actor, dines with him, and then faces a moral dilemma. Antonio, meanwhile, is involved in a classic mixup, and a prostitute with a sharp and dirty sense of humor named Anna (Penelope Cruz) is sent to his room. She poses as his wife, since his family has yet to meet Milly. However, Anna doesn’t look like much of a Milly, but she plays along. Milly’s story becomes one of the story’s most amusing. Of course Anna is on speed dial for every businessman at a fancy party Antonio attends. Both Antonio and Milly learn how to be better lovers from other lovers. Antonio and Anna’s story feels inconclusive, but Allen definitely doesn’t take it down the predictable road. Another vignette stars Allen himself as Jerry, a now retired music executive with too much ambition who is itching to go back to work. Allen is a welcome presence after being absent from the screen since last acting in “Scoop.” It is only natural that he enters this film complaining about turbulence. Despite Jerry’s claim that no psychiatrist has ever been able to diagnose him, it is easy to see where some of his neuroses come from. His wife (Judy Davis, in deadpan glory) is constantly trying to analyze him. In a very Woody Allen joke, the typical Freudian model of id, ego, and superego doesn’t work on him because he is a man with three ids. But I digress. The couple heads to Italy to meet Michelangelo (Flavio Parenti), the new boyfriend of their daughter (Alison Pill). The interesting story is not the budding Italian love affair, but rather the hidden talent that Michelangelo’s father possesses. Next, there is John (Alec Baldwin), a renowned American architect who has sold out and now builds mini-malls. Instead of seeing the ruins for the hundredth time with his wife, he decides to go for a stroll. Going for a stroll and finding something unexpected seems to be a big theme in Allen’s European chapter in his career. On a side street, John meets Jack (Jesse Eisenberg) a student studying architecture in Rome with his architect girlfriend (Greta Gerwig) and living in the same place John once lived. John becomes quite interested in retracing his old footsteps, and finds that Jack is making similar mistakes he once did, as he falls in love with his girlfriend’s best friend Monica (Ellen Page). The conversations between John and Jack at times appear to only be happening in Jack’s head. However, if this is his subconscious, then the other characters at times seem to have the ability to communicate with it. However, this is one of those outlandish elements that is never explained and doesn’t need to be, like the time-travel in “Midnight in Paris.” As John constantly criticizes Jack and gives him life advice, they talk to the audience without directly addressing them, saying that they know as well as we do that this story will not end well. This unaware self-awareness might be Allen’s way of saying he knows that this story has been played out. After all, this vignette contains a very similar story to “Match Point,” which was already basically the same story as “Crimes & Misdemeanors.” This definitely feels like the most familiar Allen story, and it even contains one of the archetypes that he basically invented (the pseudo-intellectual). The kind-of inner monologues and speaking back-and-forth to the audience between Jack and Jessie never do carry quite the same spark as, say, Marshall McLuhan’s drop-in in “Annie Hall.” Allen is at his best when he is expanding on his most common ideas, rather than just repeating them. 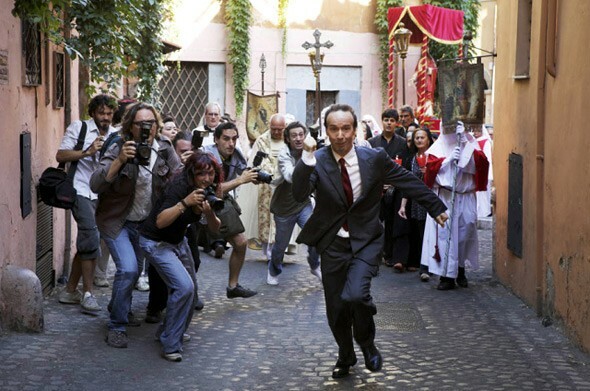 The fourth story follows Leopoldo (Roberto Benigni), an average, middle class Roman. You can tell from his gleeful strut to work everyday that he is totally satisfied with where he is. As long as he can eat breakfast with his children, gaze at the beautiful young woman in the office, and understand movies slightly better than his friends, life can’t go wrong. Then one day, he is pulled out of obscurity, put on a newscast, and becomes the most famous man in Rome. He is pestered by swarms of paparazzi all day long and is constantly asked to make a statement on subjects such as the weather and shaving. Leopoldo comes to realize that it’s not always so good to be in the public eye. Leopoldo’s story is not necessarily the most complex nor the best of the four stories. However, in the end, it feels the most satisfying and leaves no loose ends dangling. Benigni gives his best performance since “Life is Beautiful” all those years ago. And yes, it does make sense that an ordinary schmuck (his words) like Leopoldo could end up becoming famous over night for doing nothing at all. He’s not much like a Hilton or a Kardashian. He is more like Joe the Plumber, as he is famous simply because he has an opinion on whatever you ask him about. Newscasters want everyone’s opinion but what “To Rome with Love” shows is that not everyone’s opinion actually matters. “To Rome with Love” is at its best when it embraces visual slapstick that is oddly philosophical. For example, it asks why people sing under the shower with the obvious answer that everyone sounds better under a shower head. This observation is then taken to the next level when Michelangelo’s father becomes a renowned opera singer by bathing himself while onstage during shows. Things like this work because it fits very well into the world that’s been invented, where everyone becomes fully exposed in the public eye. Woody Allen is the quintessential intellectual everyman. Still, the greatest pleasure of “To Rome with Love” is seeing Woody Allen act again. Before he is even seen, his recognizable voice is heard, and the whole audience I experienced the film with immediately burst out into laughter. It was a familiar kind of laughter, the kind that welcomes back an old friend who can make our lives just a little more entertaining. This entry was posted in Alec Baldwin, Italian, Jesse Eisenberg, Movie Review, Penelope Cruz, Roberto Benigni, To Rome with Love, Woody Allen on July 10, 2012 by ian0592.